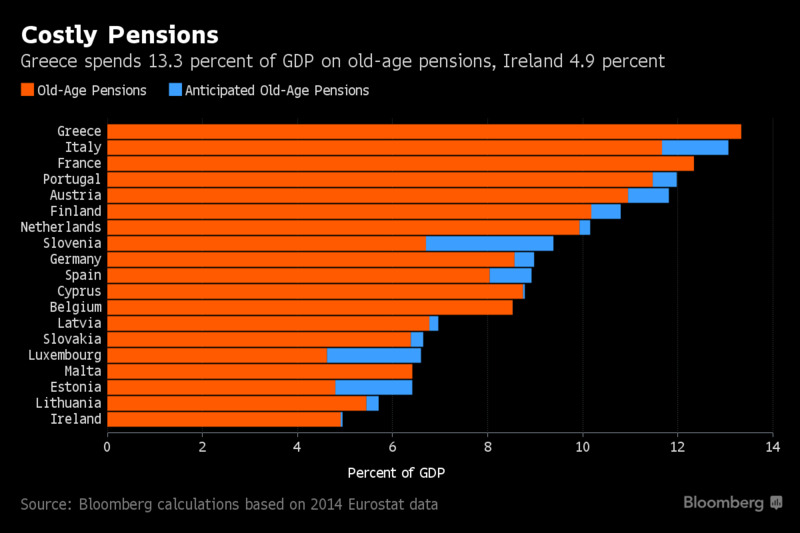 One of the biggest thorns in the negotiations between Athens and international bailout auditors is Greece’s pension expenditure, highlights a Bloomberg report that presents a graph depicting the percentage of GDP spent on pensions by Eurozone countries. The report states that Greece spends 13.3% on elderly pensions making it the highest in the European region, according to Eurostat data from 2014, which formed the basis for the calculation. Greece is followed by three countries of southern Europe — Italy, France and Portugal — while the lowest percentage belongs to Ireland spending just 4.9%.